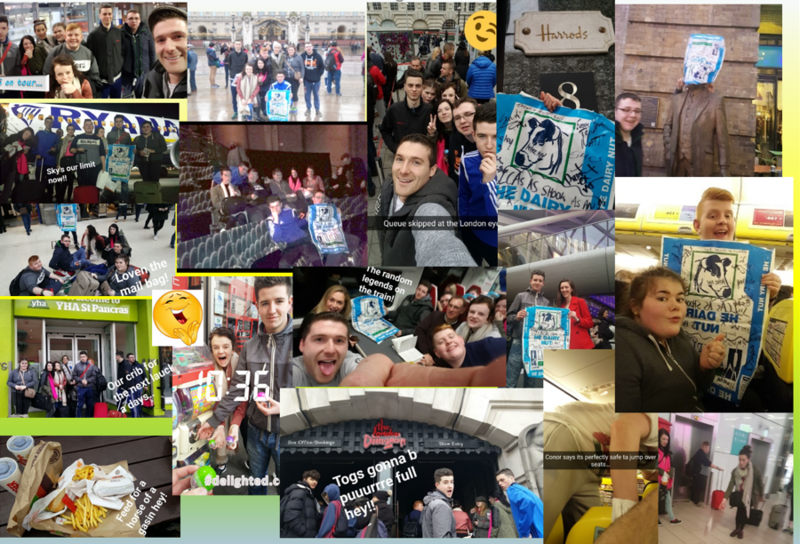 On the 15th March students from B5, Mrs (Mammy) Hanna and Mr. (absolute legend) Fitzsimons embarked on one of the most memorable school trips to London. Equipped with one of Lakeland dairys’ finest meal (Maaaail) bags, craic and the eager students of B5, we all headed off to London. After a short plane flight, we ventured onto London’s underground train network where we were walked across and squeezed onto the carriage within an inch of our lives. Our hostel was located on a very busy street and the staff were quickly charmed by the trio of Cavan, Monaghan and Fermanagh dialect. We went to burger king where we got a feed that would kill a horse stone dead. After eating through £100 worth of chips and burgers it was time for our first trip; The London eye. While Mrs. Hanna went to get the tickets, Mr. Fitzsimons was left in charge. The group accidently on purpose skipped the queue!!!!! Who wants to wait???? When Mrs. Hanna came back with the tickets she nearly had a kitten when we informed her what we did but still she had no bother in crawling under the barrier and joining us in the queue! The view from the London eye was spectacular and unreal! We could see for miles around, the sun was shining and we filled the camera with pictures. Next stop was the Queens crib. After being nearly run over by London’s finest bus and taxi drivers, we called to the Queen’s for afternoon tea at her wee humble cottage. Apparently she was out!! The beef eaters (that’s the lads with the big fluffy hats and that don’t move) were having none of us so we left ar nós na gaoithe! We hit the London Dungeons next where all the girls were pure terrified while it didn’t take a fidge out of us real hardy men. You could feel the fear and excitement of everyone there. The actors re-enacted all the torture that took place in the rare oul times! That evening we tipped on down to the musical ‘Wicked’ where they just made a pure song and a dance about everything! While Mrs. Hanna and Dylan were in their absolute element singing and clapping away and actually got the story line, myself and Deano filled our faces with pure muck and then caught up on a bit of sleep. The following day Mrs. Hanna walked the life of us again and we covered a good 1000 acres of London’s underground. After a spot of shopping on Oxford Street we made our way into ‘Harrods.’ I didn’t really understand why Mrs. Hanna and the girls were so excited that we were going into Harrods but then I got an understanding when we went through the doors and met heavily armed security men and then when I saw the prices I near keeled over!!. On our way for lunch we had the chance to drool over the Lamborghini store In South Kensington and we took a pic or two. We went for a quick feed of pizza after walking miles and then we were ready to head home again. We packed our bags at the hostel and made our way to the maze that was the underground for one last time. On route, Jayo plucked up the courage and asked a lady in red to sign our mail bag. The confused Cailín happily signed our mail bag and much to his disappointment she soon galloped off into the horizon. When we just about made it onto our train I found 2 passengers to annoy for the next half an hour. When I was sussing them out, one of them told us that she was a double for your one in the Harry Potter films. When Dylan heard this he lept across an old woman like a young calf to interrogate her about her acting career. After Dylan finished torturing her, we got her signature and of course about a 100 pictures, we headed for the flying saucepan yard (The airport). All B5 made it through the customs without a hitch. It was myself and Mrs. Hanna that were the problem! Mrs. Hanna had a load of stuff lifted and I had to give up me toothpaste, deodorant and fake tan. Then the bottle flipping tournament took place. Poor oul Nicky and Eimear couldn’t flip a bottle to save their lives and I was clearly the best. Even Mrs. Hanna gave it a go but sure she's too old to bottle flip. There were a lot of tired heads on the plane trip home but we made sure to keep everyone awake by clapping at random stages throughout the flight just to give the pilot some moral support and let him know we were still there. On the bus home we had DJ Deano boy playing the tunes on the new speakers (that he was pure robbed on) and we sang away the whole way home to all the most current hopidy hip songs (#yolo). I was kicked out of the taxi in Carrick and I bid farewell to Mrs. H and all the students and commended them on how great they were and that was that! On behalf of myself and Mrs. Hanna I just want to thank the 7 legends; Nicole, Leanne, Eimear, Dylan, Conor, Jason and Dean for making the trip one to remember. A great wee crew, the craic was great, you were an absolute pleasure to be in the company of. You all did our school and your year group proud. Well Done! For such a short trip we managed to pack in a world of great memories, craic and most importantly the lifetime friendships we developed. On behalf of the students I would like to thank Mrs. Hanna for doing all of the organising of the trip, the activities and for looking after us all as if we were her own. Lastly I would also like to thank myself for taking 3 hours out of my busy schedule to write this up! Ha! Only joking but not really! Hope you all like our wee harmless snapchat story display in the foyer! Cheers folks! Well done!